The Turkish Bath is an inspiring activity you mustn’t miss while you are in Marmaris. 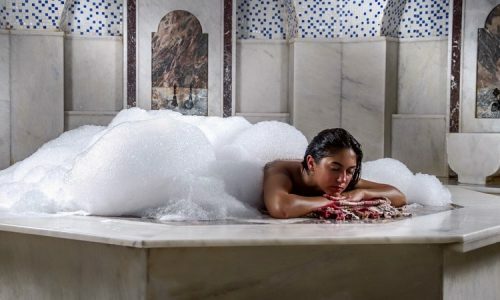 As a popular resort place, Marmaris naturally houses a good number of Spa Hotels providing quality and authentic Turkish Bath services to its visitors. The hotels are open all day long, but a session of Turkish Bath lasts for 2-3 hours. By choosing our Marmaris Spa Tours you have come to the right place to experience the Turkish Bath service of the best order. Our services are openly displayed in our website and we ensure that you enjoy the best of our Turkish Bath facility during your visit with us. In their original home in Central Asia, the Turks had steam baths known as ‘manchu’. This traditional Asian bath culture was merged with the Roman bath culture found in Anatolia. Thus a new synthesis, the ‘Turkish Bath’ was born. The Turks, with their traditions, philosophy of life and associated beliefs made baths an institution. In the course of time this culture has spread all the way from Anatolia to Hungary in Europe. Since centuries, the traditional Turkish bath has been a very important feature of Turkish Culture. In Turkey, baths are a mark of culture and social life. Apart from rejuvenating one’s body, taking part in a Turkish bath provides you many health benefits. It cleanses skin, relieves toxins, improves blood circulation, reduces stress and reactivates one’s mind as well! The baths are also beauty spas and saloons where facial, hair care and body care services are provided all over the day. Body therapies using various herbal extracts and oils are also done here. Taking part in a traditional Turkish bath provides one a relaxed feeling. Our Marmaris Spa Tours and their price includes services like comfortable hotel transfers, special care at the sauna like Scrub Massage, Face Mask, Foam Massage, Hair Care, Foot Therapy, Fish Therapy and Aromatherapy. All of these special treatments are devised by us to suit persons with all skin types. Our well-trained masseurs serve you with care and help you get relaxed and attain complete rejuvenation.